11 January 2017, Damascus, Syria– An estimated 5.5 million people, including 2 million children, have been cut off from running water for over three weeks in Damascus and its surroundings, the longest cut Syria’s capital has seen. Intense fighting damaged the water infrastructure for the two main drinking water sources for Damascus-Ain El Fijeh and Wadi Barada – located in a mountainous valley near the capital. Water rationing programme was initiated by local authorities allowing some neighborhoods to receive running water for up to two hours every three or four days, barely enough to cover basic needs. “When my father tells us it’s our turn to receive water, we prepare everything we can fill at home – bottles, jerry cans, pots and pans,” said Bashir, a 12 year-old boy living in Al- Midan neighborhood of Damascus. “When the water comes, it’s just like a party for us!” he added. As the water crisis continued, families resorted to alternatives such as buying water from private vendors for double the price with no guarantees on quality or safety, raising concerns of the risk of waterborne diseases, particularly amongst children. In some areas in Damascus, people are paying up to US$12 for 1,000 liters of water from private companies. The same volume of water used to cost just US$5 a year ago. Last week, Bashir was hospitalized due to abdominal pain, diarrhea and vomiting. “At the hospital, they told me that the cause might be contaminated food or water,” said Bashir who missed two days of school when he fell ill. The burden of collecting water disproportionately falls on children. Many have to wake up before dawn to queue at local water distribution points before they run dry. Walking long distances under the weight of heavy jerry cans has become daily routine for many children. Time that should be spent playing, studying or resting is replaced by hours of collecting water. Every other day after school, Dania, 11, walks to a nearby mosque with her father and grandfather, carrying a 10-liter jerry can to collect water. The 15-minute journey feels longer on the way back. “I get tired on the way back, but I take a break every few steps. I also drag the jerry can when I can’t carry it anymore,” said Dania. “I don’t ask my father for help because he usually carries 2 or 3 jerry cans every time so I try to help even though my arms and lower back hurt.” she added. 12 year-old Abdulrahman goes through the same struggle daily. Instead of doing homework, resting or playing with friends, he spent hours fetching water for his family. “Every day after school I tie three empty jerry cans to my bike and head to a nearby mosque to fill them. It’s tiring but I’m the eldest of my siblings so I have to do it for my family.” He said. Around 700,000 people in Damascus, most living in elevated areas, have not had any water for more than 18 days because of the low pressure due to reduced volume of water coming from underground wells, the only source for millions of people since water from the mains was cut on 22 December 2016. Sever water shortages are putting additional strain on families already suffering from long power cuts and lack of gas and heating oil in the midst of bitter cold weather. As part of its wider water, hygiene and sanitation response in Damascus, UNICEF had already rehabilitated and equipped 120 underground water wells in and around Damascus that cover needs for up to one-third of daily water needs in the city. These water wells ae currently in full operation to respond to the ongoing severe water shortages. UNICEF is supporting water wells and pumping stations with fuel, spare parts and repair to increase water production and pumping to a maximum of 200,000 cubic meters per day to reach up to 3.5 million people with drinking water. 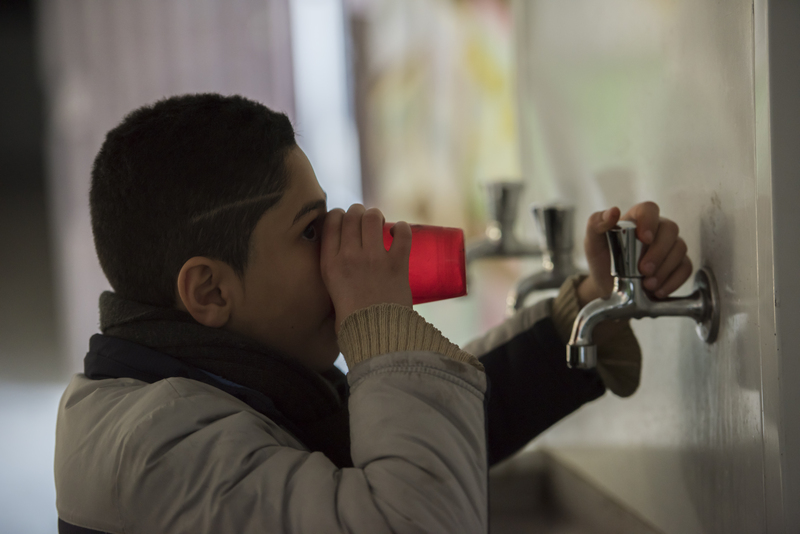 In order to ensure a suitable learning environment for children, UNICEF started emergency water trucking to 84 priority schools in Damascus, benefitting more than 30,000 school children. UNICEF is standing ready to support repair work of the damaged water source and network as soon as access is granted, to ease the suffering of children.